Same ol’ same ol’ Take 51 year old parts off car, wait for new parts. The engine is finally cooling as it should be. That was achieved by following the basics of cooling system troubleshooting. Unfortunately over the last couple of weeks it’s been anything but cool. Or as we call it August. There is a lot of misunderstanding and some outright old wive’s tales (are we allowed to say that anymore?) when it comes to dealing with these old cars. 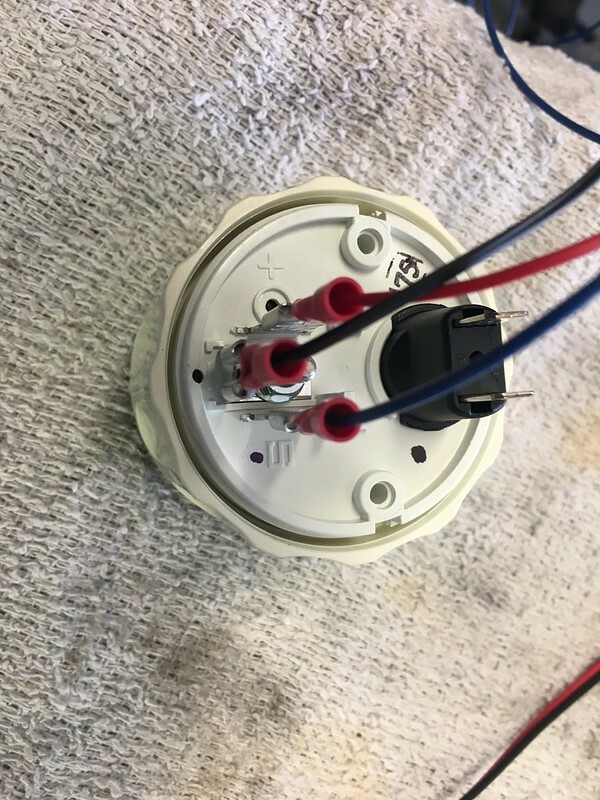 First and foremost would be what a thermostat does and how it should function in the cooling system. Another would be how the laws of thermodynamics work in facilitating heat transfer in the system. A lot of guys will play parts darts by guessing and supposing instead of employing a methodical approach to solving the problem. This isn’t the place to get too in depth in the troubleshooting procedure but here are the basics of what I did. You’ll remember from some posts back that the car would get hot and start to stall until finally vapor locking. In this case it was a combination of issues. 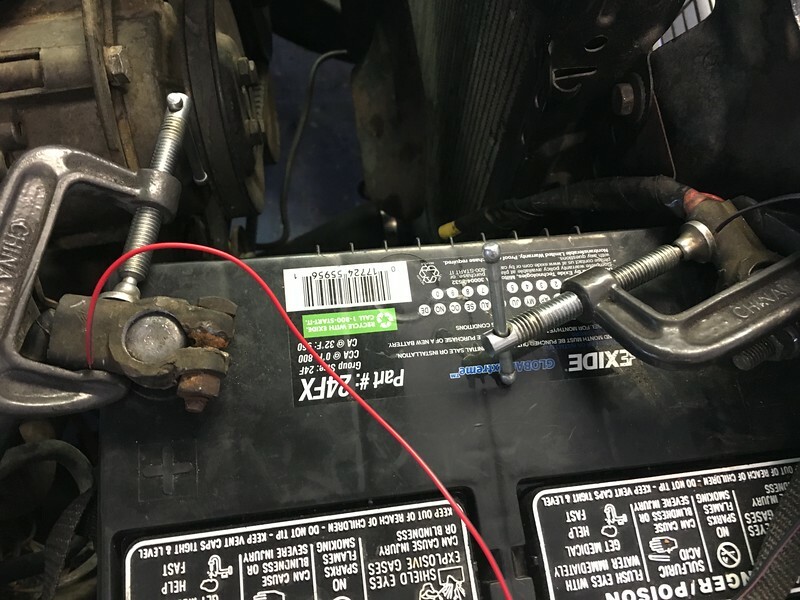 The car was getting hot, the thermostat was stuck closed. There were some minor leaks in the system the worst being the manifold outlet. The engine and radiator had 50 years of crud embedded. With some basic diagnostics and a few parts and a flush I was able to get the cooling system back in shape. The most important part of knowing if your cooling system is running is spec is to first, know what that spec is. A lot of guys not well versed in cooling systems show up and think that cooler is always better. Well, it depends. There is an operating window in any build and what that window is depends on the design of the build. On a stock 1967 Mustang 289 the recommended operating range is between 195* and 210*. Not 190, not 180 but around 200 give or take. That’s where the engineers and designers have determined this particular combination should run. 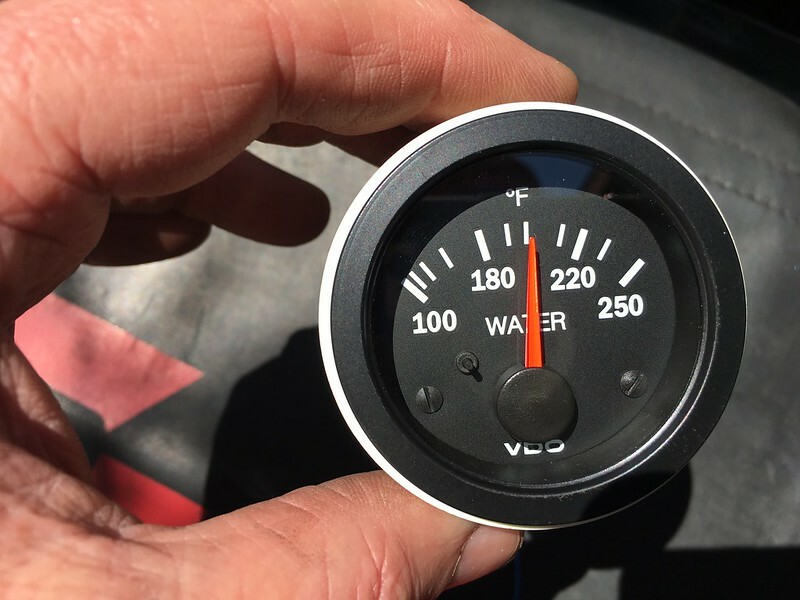 To know that you’re in that range you need to measure the coolant temp. 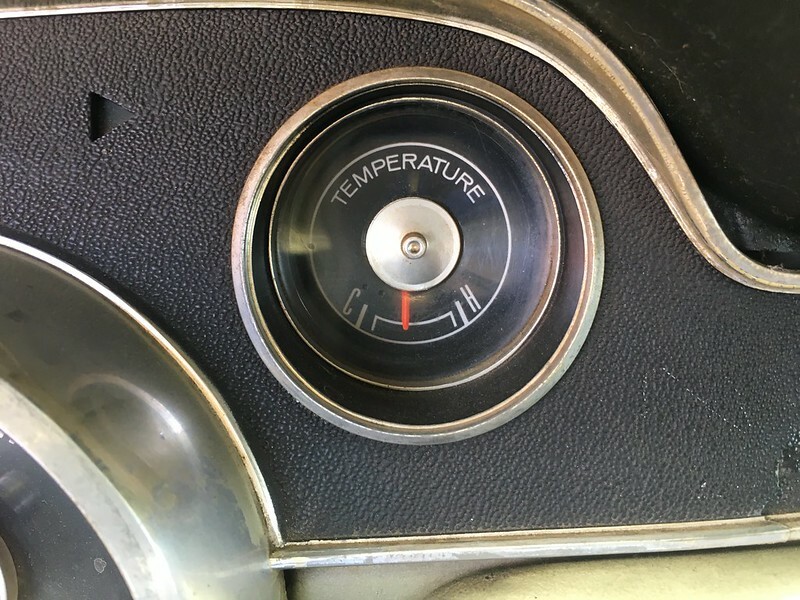 Not the temp on the outside of the parts of the engine, not the stock gauge with no numbers. The actual temperature with a gauge with numbers and the proper sender. Ok, good enough, but where are you going to mount it in the car? Where are you going to mount the sender? I chose to mount the sender in the heater water outlet in the intake manifold. I’m going to stay with this for a while. To do this I had to mod the fitting. 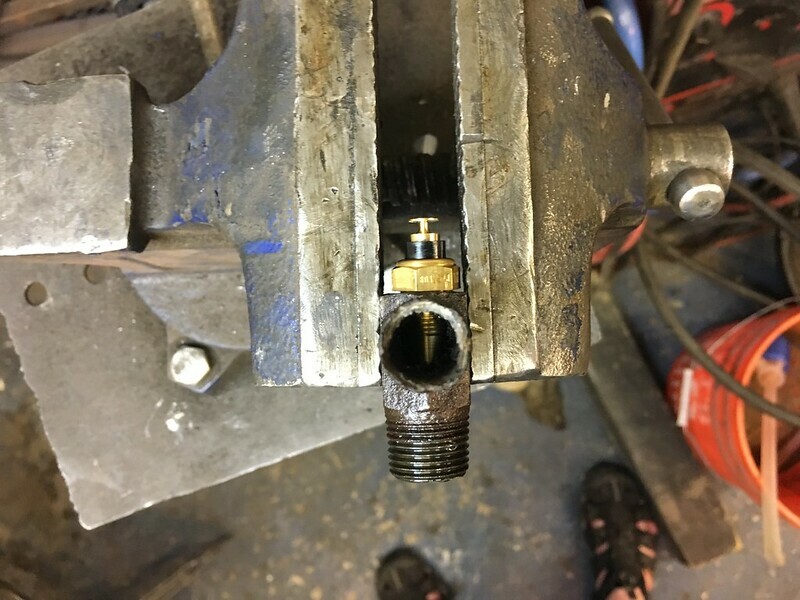 I drill a hole to tap an 1/8″ NPT and use that. Boy is it tight. I used the old fitting as a test. And good thing too because the new one doesn’t fit. With the mounting taken care of and still no good idea where I wanted to mount the gauge in the car I set about wiring it and testing it to see where I was with the temp. To get it going I powered the gauge directly from that battery. I’d taken out the radio previously to get a better look under the dash but still didn’t have a full plan for powering and mounting so this will be a quickie temp job. The wiring was cut with extra length as this will be the harness that is used. The ends that needed terminals got them and the power and ground to the gauge assembly will be cut to fit once I decide where the hell to put it. 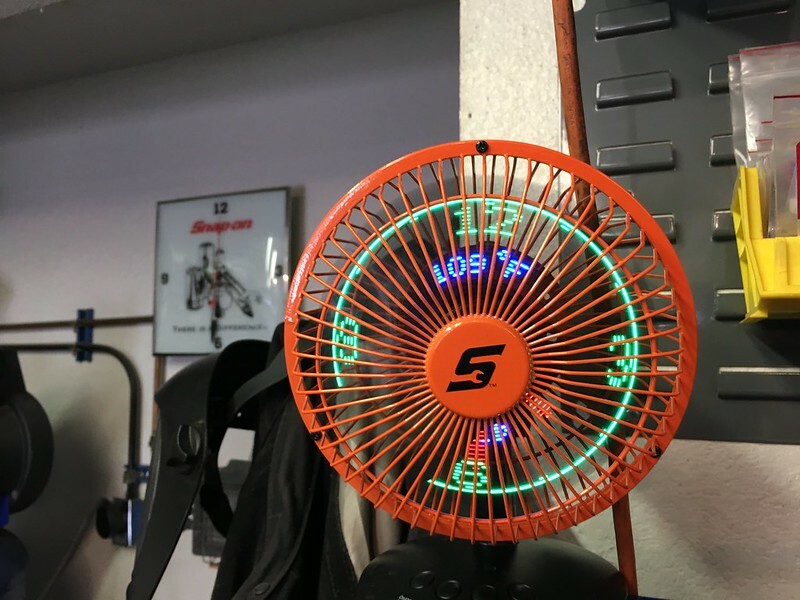 I didn’t bother with the gauge lamp just yet. That’s going to have to be tagged into the dimmable dash light circuit. To know if it’s working I fire up the car and run for about 15 mins to bring it up to temp. It’s just a shade over 200* let’s call it 205*. I’ll compare that to the stock gauge which is about half way. For the real test I go out and drive 10 miles or so and come back. Because its tagged in temporarily I’ve got to remove it for the drive. When I get back I leave the car running and jump out quick and reinstall. It would roughly model what it would be like to be driving and stop at a light or stuck in traffic. Takes only a minute or so to jump out, pop the hood and tag the gauge on. So with the baseline established until I stab the gauge into the car I’ll be able to get a good read on what’s going on using the stock gauge. I put about 40 more miles on testing including a 20 mile single shot stopping for a few mins to test the hot restart. It’s a bit cranky on hot restarts. If you just hold the gas down it will fire right up even in 105* ambient heat. (forgot to mention, all of these tests were around 105* outside) I’ve got some adjustments to do in the hot choke. I’ve dialed the choke in a bit but there is still something that makes it just a bit hard to kick over when it’s hot. With the carb rebuild the throttle response is much improved. The rich/flood condition has been fixed. What I called the “Stab and Stall” where I’d accelerate then get off the gas by completely lifting then punching the brakes then stalling is solved. That was likely the dashpot. Prior I could replicate the stall at will or could avoid it if I feathered out of the throttle or went to neutral and kept giving it little burps. The throttle was just slamming shut. Now it responds like it should. 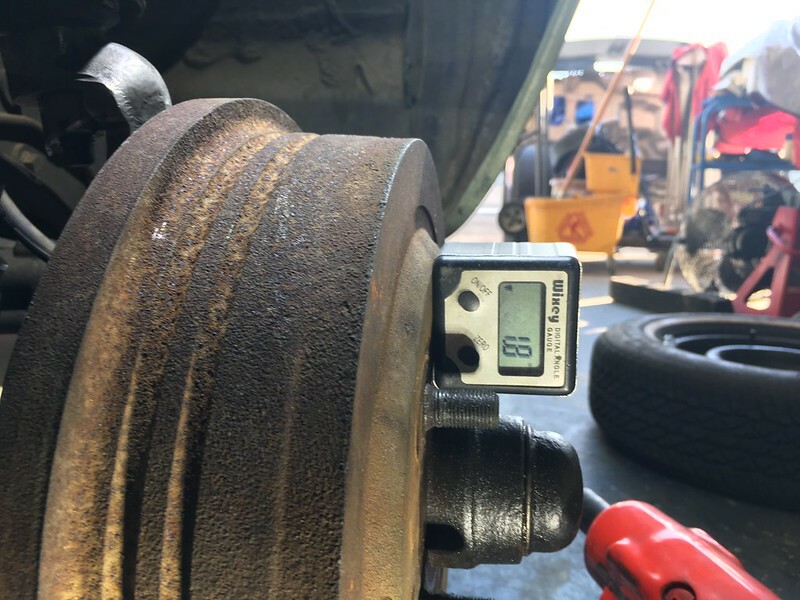 Before I did the last road test I needed to throw a rough alignment on it and re-torque the knuckle/ball joint connection. On the previous tests it was coming loose. It was a bit tough to get a 1/2″ drive on the lower and I didn’t have that size in 3/8″ drive in a mid length. The shallow chrome sockets I have bottom out on the ball studs. 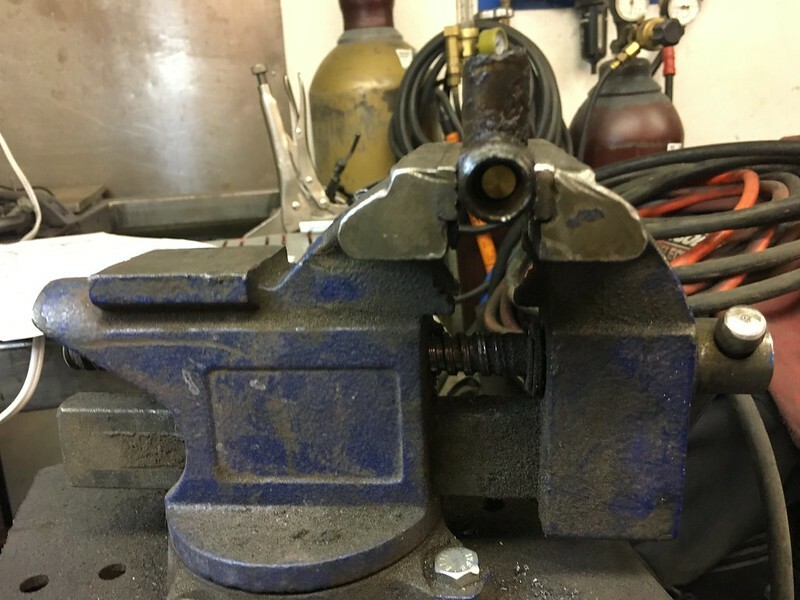 So I used this opportunity to fill out my 3/8″ drive SAE mid size impact socket rack. I opt for impacts if I’m going to have to choose between that and chrome. You absolutely can crack a chrome socket if you hammer it too much in an impact. Mid lengths are great. It’s my go to socket. A mid size is as the name implies between a deep and shallow socket. I had never seen them until I started shopping on the tool truck years back. That would be a great addition for HF. When I first brought the car home I only had mid size SAE impact sockets. I was using chrome shallow and deeps and having to hit the well worn carcass of the underside I needed to get some deep and shallow SAE impact sets. With the right tool I was able to get them tightened. It can also be done with a combination wrench (or ratcheting box) with a bit more effort. The clearance with the torque wrench head made it a bit wobbly so I used a torque extension wrench. 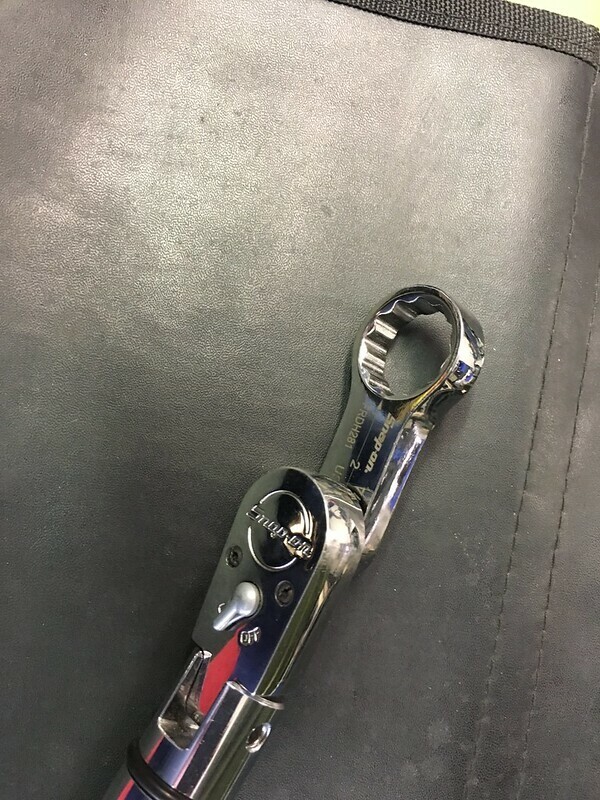 A torque adapter is basically a box end wrench type extension for your torque wrench. There are also parts on the Ranger build that need these sizes. You can’t get a socket into some of those places on the Ranger. 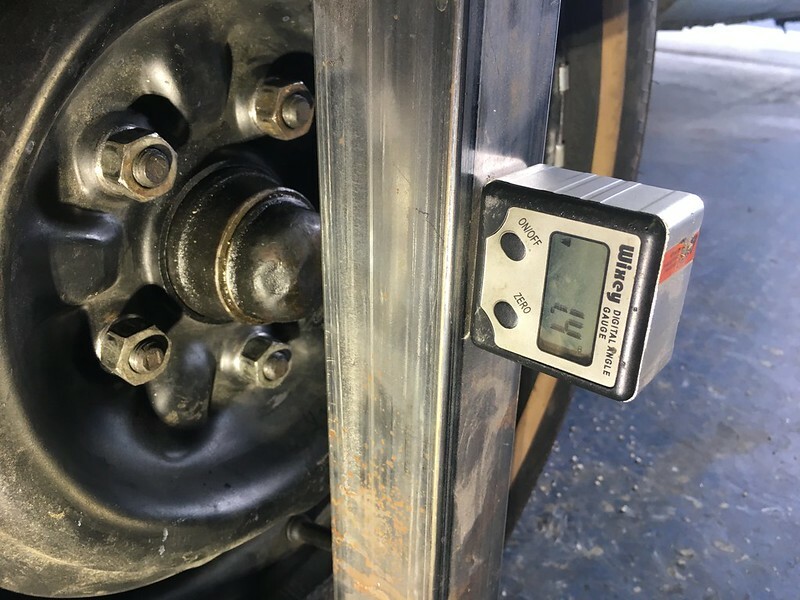 With the extra length of the torque adapter you need to recalculate the torque value setting on the wrench using the distance from the center of the adapter to the center of the torque wrench drive. There are calculators online to help with this. I put a shade tree alignment on it. I use a combination of string line, a digital angle meter and laser level. At this stage of the build with so much still to come off and on the car plus new tires it’s better than paying the $100-$150 or so for an alignment only to have to have it realigned after every change. I’ll get a real alignment after I’m done front and rear when I get new tires. What I do is use a string line with the tires on all corners to make sure it’s reasonably straight. The camber on this build was so far out of whack from the new bushings and ball joints I took the tire back off to make it a bit easier. It takes me better than a couple of hours to complete one of these when I’m not familiar with what the difference is between static and under load. The more you did it the quicker it gets but it’s more than a model to model difference as it is a specific car to car difference. A funny, or not so funny part, was when I looked up the camber specs. I’m used to dealing in the road racing world with negative camber, asymmetric camber for circle track. When I looked at the specs in the FSM I didn’t register that this Mustang needs positive camber. So when I set it and drove it it didn’t feel right. A big bunch of it was the steering was still old, my caster probably wasn’t near optimal. The contact patches didn’t look right even when it was static. Looked at the book again to check my measurements and DOH, I went the wrong way. I saw the number and didn’t pay attention to the degree direction and ASSumed it was one of my road race cars. Start the process again, camber and toe. The caster is a bit trickier for me on this one. It turned out OK but since the steering is in need of a refurb it’s tough to tell other than it’s better than what it was. And it keeps running. As I type this the steering parts have been off for a few days. It will get a full rebuild and refurb. That’s next up on the docket.